During this two-day class, paint your beloved pet, a memorial for a passed furry friend or a gift for the pet parent in your life–or just learn how to accurately paint any animal. Paint your portrait using a monochromatic palette and learn about the significance of value contrast. 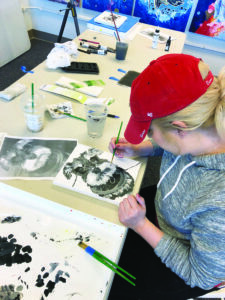 Students will supply two printed photos of their pet/animal, one of which will be used to transfer the design to the canvas and the other to observe during the painting. 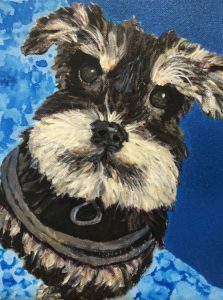 While you will be painting a beloved animal, you will also be learning traditional oil and acrylic painting techniques. This workshop will use professional-quality acrylic paints with no fumes or solvents. Ages 14 through adult. Younger students may take the class with a paid, participating chaperone. $80 Tuition (materials included) plus sales tax.